Moist Soil vs. Overwatering vs. Something Else? My best attempt to ask a convoluted question. I know what I list below doesn't apply to EVERY plant, but this is in regards to what I consider the average house plant's needs. I know that no plants like to be overwatered, that pots with drainage are best, soil with good drainage is important, and roots don't like to sit in water. I haven't had plants for long but I think I'm a decent judge of when plants need water and when is too soon. That being said, there are a few plants I own that take forever for their soil to become dry. It's not a puddle of water, but it stays consistently / evenly moist for much longer than my other plants. An example here is a Grape Leaf Ivy I purchased a few weeks ago. The soil was moist when it arrived, and it still is after at least 3 weeks. Is this something I should be concerned about for any reason? I suppose I worry about mold or root rot or who knows what. Just not sure if there's something I should be changing, or if it's the soil the plants came in and I should change that or if they aren't getting enough light, or what! PlntNrd How much light is this plant getting, how humid is the environment, how big is the pot, and is there a hole in the pot? First, the less light, the less water the plant will need/use. If you have a plant in a low light area, you won’t have to water it as often as the same plant in a high light spot. Second, if it’s in a humid environment, like bathroom, it could take longer to dry out because of the humidity. Third, bigger pots take longer to dry out. I have some 12 inch pots that I only water monthly, while my 4 inch with the type of plant, I have to water weekly. Last, and very important, if there isn’t a drainage hole and it’s taking a very long time to dry out, you are probably giving too much water at one time. When watering plants in pot without drainage hole, it’s best to give very small amounts. The same goes for watering plants without holes, but with a “drainage layer”. If you’re watering higher than the drainage layer, then the soil will be just sitting in soggy wet soil. Erin Such a great question! How's the drainage for your grape leaf ivy? If you don't see any symptoms of overwatering, and the plant has generally decent drainage, I don't think it's something to be concerned about! 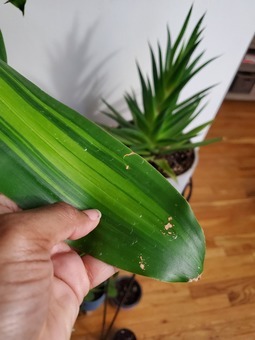 I aparently have a nat or something in my apartment and is eating her leaves this goes for my yucca tree(yvette) as well. Does anyone know if there is something i can put on the leaves to stop this from happening? Without doing harm to the plants? Pei What kind of Gnats do you know? Those markings look more like underwatered or cosmetic damages to me! Most common plant gnats are fungus gnats. However, they do not attack leaves or plant itself. They are caused by overwatering and they lay eggs in the soil. i recently adopted large plants; 1 ficus and 1 Norfolk Island pine. I’m not sure when the last time they were repotted or received new soil. Given the size of the plants and size of the pots, what do you recommend? PlntNrd Whenever I bring a new plant home, I like to wait a few weeks before repotting them. This allows them to adjust and adapt to their new environment before shocking them with repotting. Some people like to do both right away and shock them all at once, but I’ve had much better luck letting them adapt first, then transplanting. Too much shock at once, in my experience, can cause issues and sometimes they don’t recover. 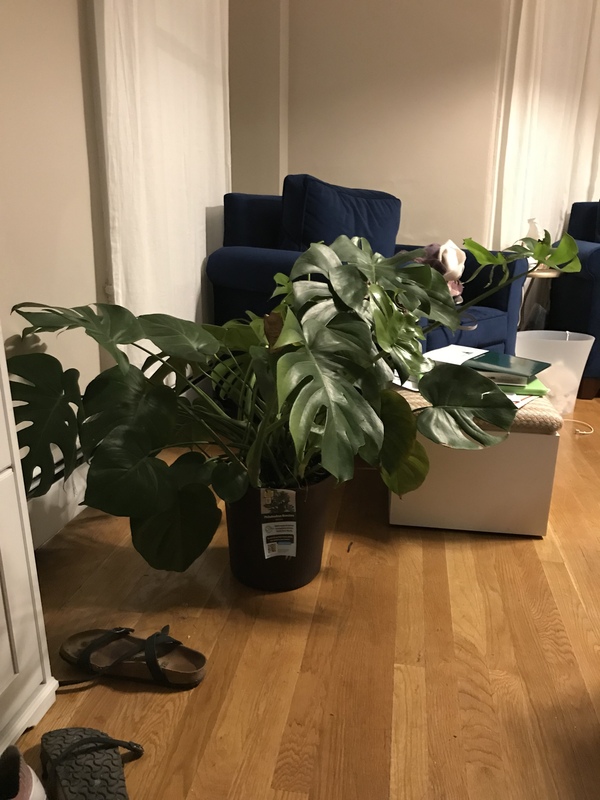 I would wait a couple weeks to a month, then I would repot with fresh soil and if the roots look like they need it, go up a few inches to a bigger pot. Good luck with whatever you decide to do. Hi! 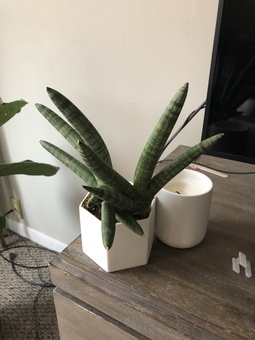 Wondering what kind of plant this is and what’s the best way to care for it. Any help or advice is much appreciated! 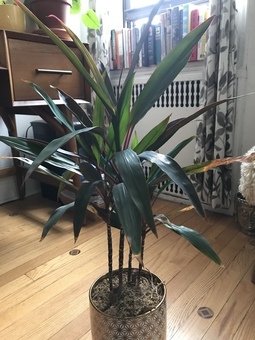 Pei it looks like a cast iron plant (Aspidistra elatior) or cordyline too! PlntNrd It looks like either a Ti plant or a Cordyline. I think Ti though. 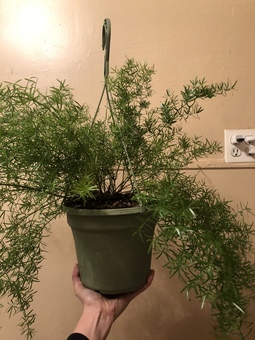 I just bought a 6” hanging asparagus fern and wondering if anyone has experience taking care of them? I killed one a while back that I was never able to find the right light and water requirements :( want to do it right this time!! Erin What a beauty! I heard they thrive in bright light with weekly waterings / misting. Good luck! 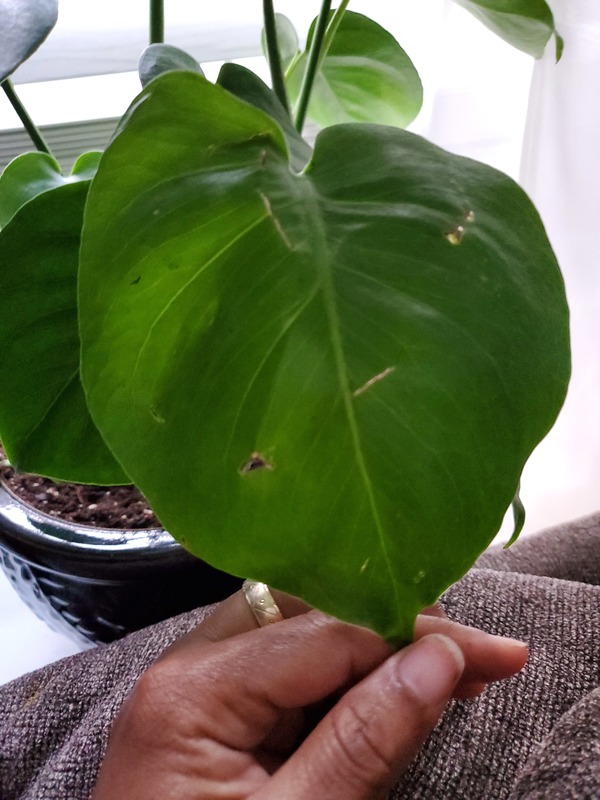 Recently I received a 6” monstera from sill as a gift and while watering it today I noticed apx 5-10 tiny flies fly from the soil. Anyone know what this means or what to do? Pei Does that pot has drainage? Fugus gnats are annoying to deal with, but it's a good indicator that the soil has been consistently staying too moist. So I'd recommend to let the soil dry out completely – at least 3" deep – and make sure you only water when the soil is dry to touch (same depth!). And yes, Monsteras like bright light even half day full sun would work too. They need the energy (sun) to put the splits and holes btw!! Erin Fungus gnats love moisture! I'd recommend letting the soil try out completely before watering again. 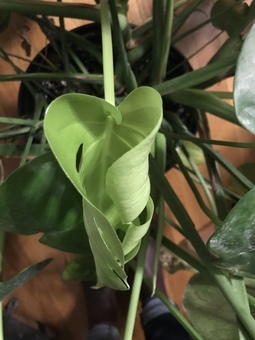 You can help it try out quicker if you put it in a spot where it receives bright indirect light, which monsteras love anyway. If you want to really deter them, I'd get some diatomaceous earth from amazon prime or your local hardware store and sprinkle a generous amount in the soil too. Hello! I got these two monstera plants a few weeks ago and they've settled nicely into my home. However, their are some roots peeping through the drainage hole and the small/short leaves at their base have turned yellow despite me not overwatering, and so I think it might be time to repot and since it's the beginning of spring, it seems like a good time. 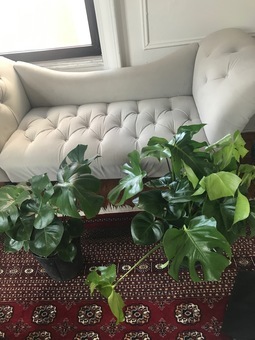 What mixture of potting mix do you recommend, including the ratios, for these monstera? I've been reading about mixes that contain half/half regular potting mix with cacti mix along with perlite mixed in. Please let me know which ratios/combinations have worked best for you! 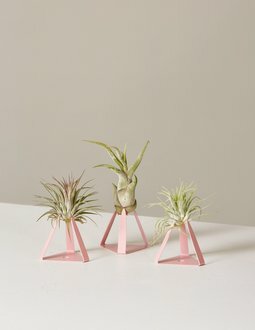 Also - is it okay to repot these into bigger nursery pots with drainage and then place them in decorative pots? I see that some people do this but I'm unsure if they can remain in a plastic nursery pot longterm until a next repotting. thank you! Pei Agree with [291076,Janee] - I like use fox farm soil!! One thing i do want to point out is that the roots you saw above soil are actually aeroid roots. YOu don't want to bury those in the soil, well event if you do, they will "crawl out" naturally hahah! Janee fox farm soil just use that my monstera are doing really well in it. Also i think which plant pot you use depends on what kind of plant keeper you are. 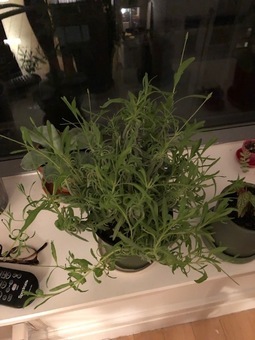 I brought a lavender plant home to test it out, and it seems to be doing well in my south-facing windowsill! Now that I know it'll survive – I want to move it from its plastic grow pot into a planter. Any recommendations? Is drainage key here? Pei You are so luck!! South facing widow is the best for caring lavender. Drainage is definitely the key here. Lavender likes to dry out between waterings so it's best to use a terra cotta pot IMO. 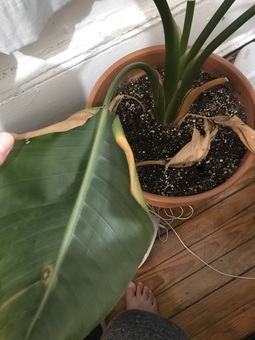 Bird of paradise root rot? Hello! I’ve had my bird of paradise plant for about 2 years, but the past few weeks it’s been looking pretty sick. I water it every other week with tap water (when the soil is dry ~2 inches down). I’ve already had to cut the bottom 2 leaves off since the leaves have been curling, then turning brown, then die. And now it’s spreading to the next leaf and I’m worried the plant is dying! 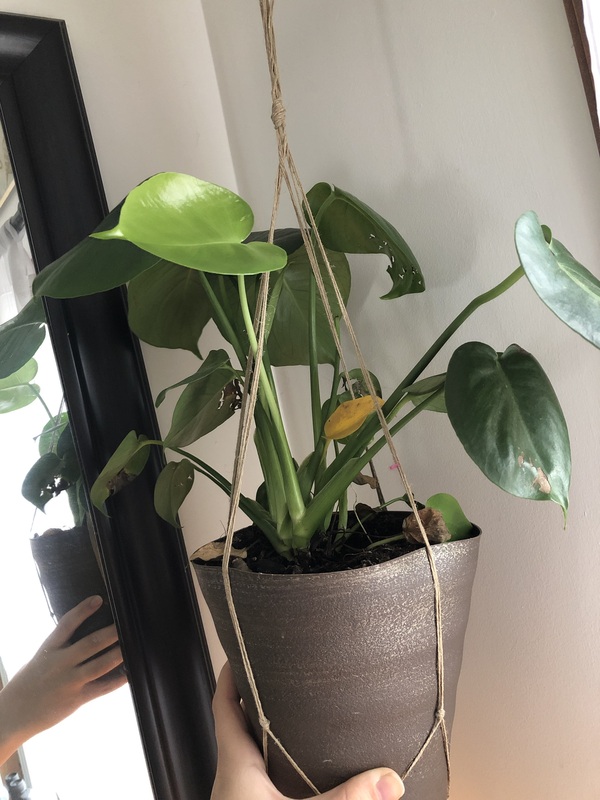 I did a little reading and am wondering if it’s root rot, and whether I should replant or do something else? 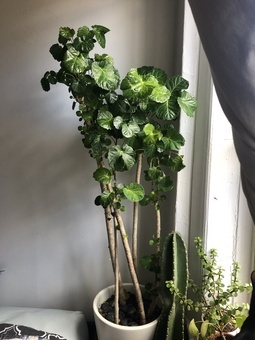 I really love this plant so any suggestions are much appreciated! Pei [293996,Claire Casaregola] how much water do you give each time? Also what kind of light does it get? When was the last time your refresh the soil? Gynura Aurantiaca (Purple Passion) - To Trim Or Not? I have a purple passion that has been growing like crazy and now has 3 pretty solid stalks with big leaves, each around 12"h.
I'm not sure what my next step with this should be. Sometimes I've seen these grown in hanging planters to cascade a bit, which could be cool. Will these stalks naturally (and safely) just start bending over and growing downward? OR should I be pruning it down to make it into more of a bush? Part of me feels like I should be doing this and maybe even trying to root the clippings in the same pot to make the whole thing fuller. In this case, I'm more afraid of doing something that will damage the plant. Not so worried if the clipping don't take root, but it's been growing so well I'd be sad if I hurt the main plant. Anyone have experience with any of this? 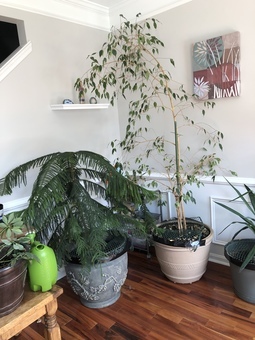 I am a fairly confident plant parent, but definitely struggle with keeping my Aralia happy. Does anyone have any tips to share? Pei [291063,Plants_Armstrong] here it is! What to do with these succulents? Hi all, a friend gave me a pot of these succulents and I really like how they look! However, I have no idea how to care of them or what to watch out for, and I'm worried about possibly over/underwatering them. Could anyone tell me what kind of succulents these are, and what to expect as time goes on? Pei [293438,Stephen] i think it's up to you. 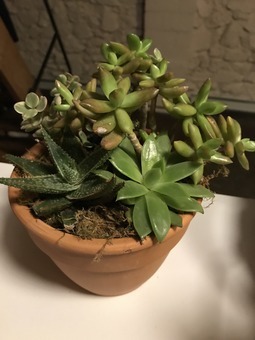 Some people like it full and spill out of the planter look, some people don't :) Also, succulent roots are usually shallow so it's ok to have many in a same pot. PlntNrd Here’s s pic of one of mine and you can see I like them crowded. 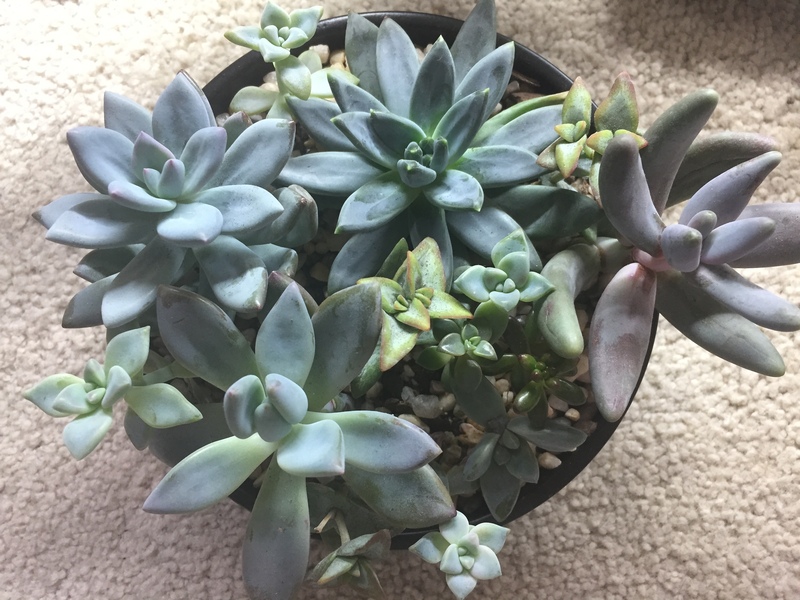 I squished as many as I could in this pot and it’s been flourishing for a long time. Pei Hi @stephen it's a mix of assorted Echeveria, Haworthia, and possibly a Jade (in the back). Succulent care is all the same - lots of sun (6 hours of direct sun if possible) and water once every 10 days. Make sure the soil is completely dry out between waterings. Also you want to fully saturate the soil by soaking the plant for about 10 mins and dump out any excess water. Hope this helps! 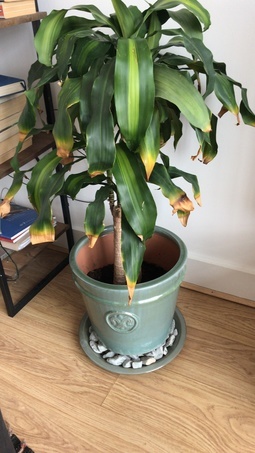 We have had this corn plant for a year and half and we have been struggling with browning/yellowing leaves and wanted to seek some advise on how best to look after it. We live in a flat in London with ceiling to floor windows which means the room does get very warm and very cold- depending on the time of the year. The plant does not sit in direct sunlight. We ensure the soil is always damp and it has a large pot which we have recently placed on stones to airate it. Please can anyone provide any hints or tips to get it back to full health. Thank you. PlntNrd When you say that you ensure the soil is always damp, how much and how often are you watering it? I know it seems odd, but overwatering can actually cause leaf tips to get brown/yellow and crispy like this. When you give a plant too much water, the cells fill up, passing the water on to the next cell, and eventually it gets to the leaf margin and there’s still excess water, but no more cells to absorb it. The water has to go somewhere, so what ends up happening is the cells along the margins of the leaves end up rupturing, which causes brown and yellow crispy tips. These also like humidity, which can cause crispy leaves. It looks like you have a pebble tray under your plant. Fill that pebble tray with just enough water to keep the level below the top of the rock line. That way there’s no issues with there being too much water and your plant absorbing the extra water through the drainage hole. Whenever the water dries up, fill up the tray again. This will provide a consistent level of humidity around the plant. Another issue that could be causing the margin to brown is the temperature. How cold are we talking here? Ideal temps for these guys are between 65-75 F. If it’s getting below 60-55 in this room, that is too cold and could be causing the damage. You might consider moving it to warmer spot in winter or getting a small heater for that room, but place it far enough away from your plant. Should I repot bigger and/or separate the two plants? PlntNrd Sansevieria cylindrica do fine when rootbound and it’s usually advised to repot these guys every 2-3 years in the spring or if they have gotten so big that their roots are growing out of the bottom of the pot, they have so many offsets they’re really overcrowded, or sometimes the rhizomes get so big they even break the pot. You can look at the bottom of your pot to see if any roots are coming through the drainage hole and, if you would like to really see the roots, let the soil dry out and then carefully slip it out of the pot. Or, if you think the offsets are just overcrowding the parent plant, you could either uppot or separate. That’s really personal preference. Would you rather have multiple pots of this sans or share it with someone. Or, would you rather let it form in to a large clump? If this was my plant, I would probably separate this one and have two. Then, I would allow one of them to grow in to a large clump, keeping all of the offsets together in one pot and I would use the other one for making new plants to keep and share.